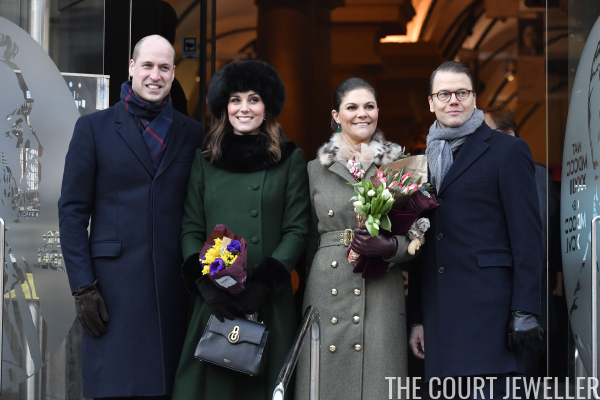 The Duke and Duchess of Cambridge embarked this morning on a four-day tour of Sweden and Norway, starting off in Stockholm. 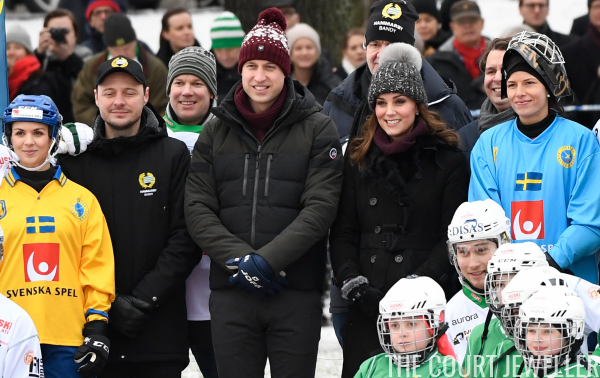 The Cambridges started their day by meeting a group of local bandy players on the ice in Stockholm. 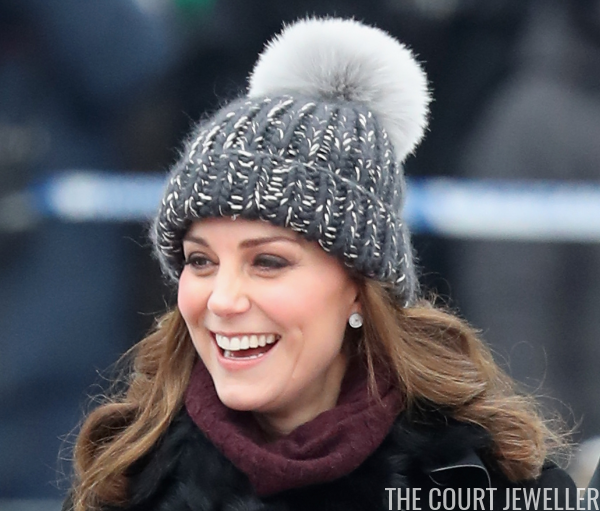 Kate wore her Asprey diamond and sapphire stud earrings for the sporty event. 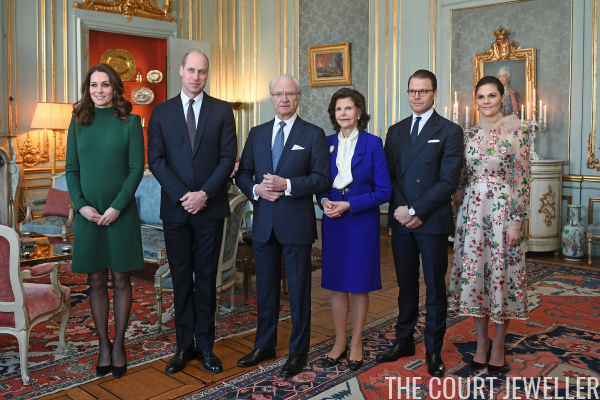 For a luncheon with the Swedish royal family, William and Kate changed into something a bit more suitable. 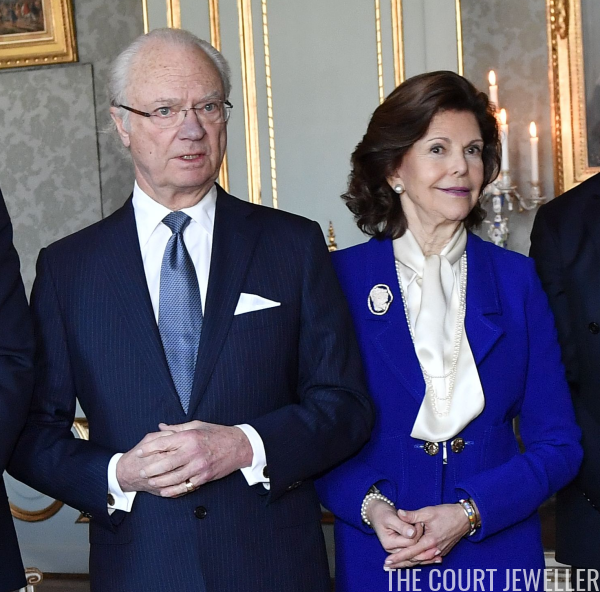 Queen Silvia wore pearls and a modern brooch for the lunch. You can see another view of the brooch here. 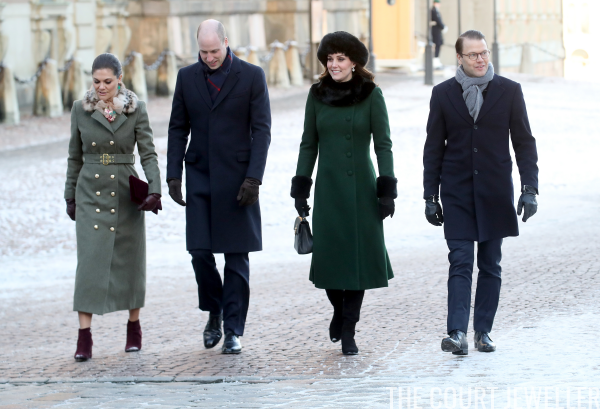 Victoria, Daniel, William, and Kate ventured out to the Nobel Museum after lunch, wearing the same clothes and accessories but bundling up against the January cold. Victoria wore a pair of Misst earrings set with purple and green stones. 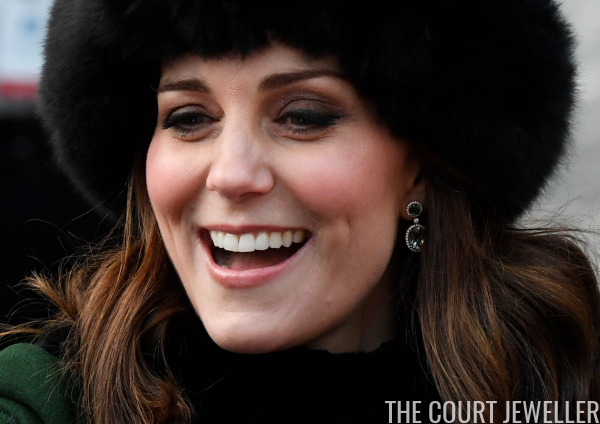 Kate also opted for green: the custom Kiki McDonough green tourmaline and green amethyst earrings that she previously wore during her visit to India. 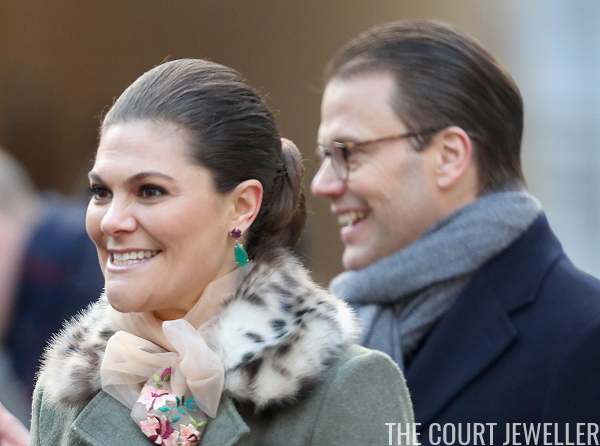 (See a close-up of the earrings here.) The custom pair were made to celebrate the birth of Princess Charlotte. 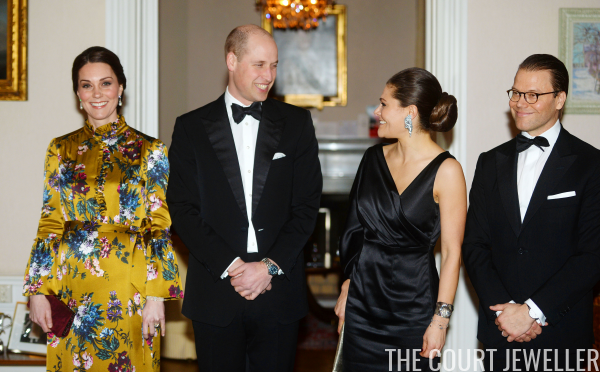 This evening, William and Kate joined Victoria and Daniel at a black-tie dinner held at the British Ambassador's residence in Stockholm. She paired the jewels with a black dress; here's a look at the entire ensemble. 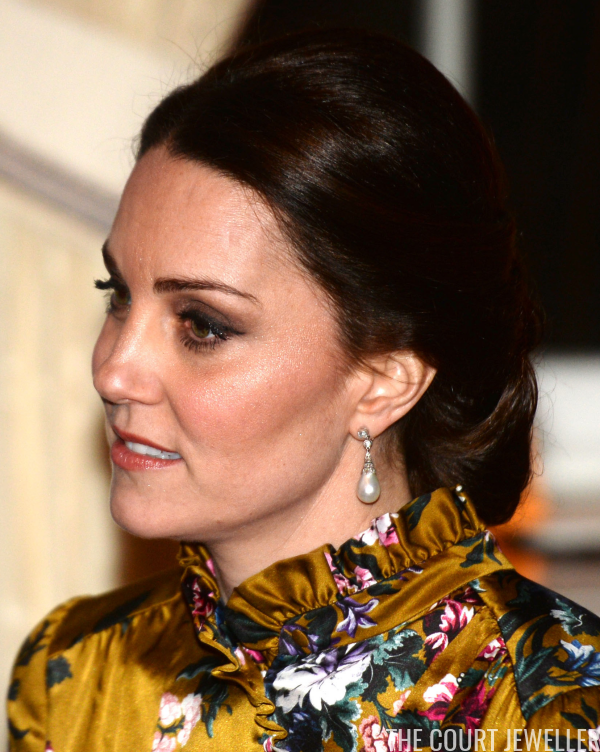 Kate chose the pearl drop earrings from her late mother-in-law, Diana, for the reception. 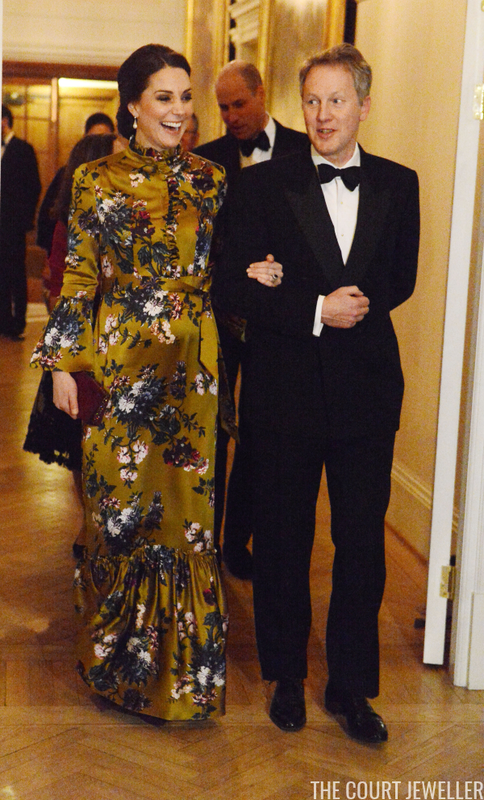 The pearls were subtle accessories, a good choice given the bright, bold pattern of Kate's gown. The dress isn't typical of Kate's style, but it does look similar to gowns worn by Scandinavian princesses. Isn't it easy to imagine Mette-Marit or Mary wearing the dress?